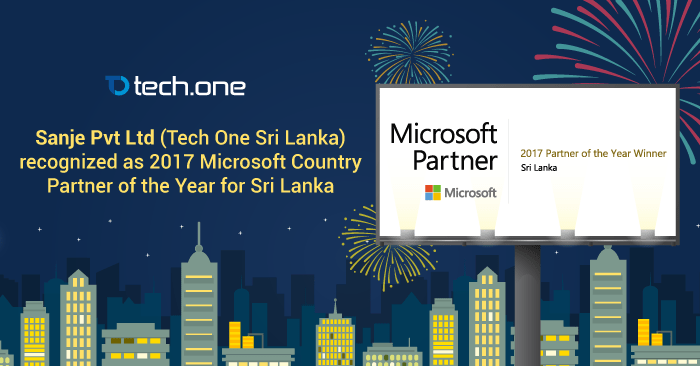 Colombo, Sri Lanka — June 1, 2017 — Sanje Pvt Ltd (Tech One Sri Lanka) today proudly announced it has won the 2017 Microsoft Country Partner of the Year Award for Sri Lanka. The company was honored among a global field of top Microsoft partners for demonstrating excellence in innovation and implementation of customer solutions based on Microsoft technology. Awards were presented in several categories, with winners chosen from a set of more than 2,800 entrants from 115 countries worldwide. Sanje Pvt Ltd was recognized for providing outstanding solutions and services, as well as representing excellent subsidiary engagement in Sri Lanka. The Microsoft Country Partner of the Year Awards honor partners at the country level that have demonstrated business excellence in delivering Microsoft solutions to multiple customers over the past year. This award recognizes Sanje Pvt Ltd as succeeding in effective engagement with its local Microsoft office while showcasing innovation and business impact, driving customer satisfaction, and winning new customers. Sanje Pvt Ltd is passionate about delivering the latest solutions and insights to companies. As a Microsoft Partner for many years, Sanje Pvt Ltd prides itself as the go-to partner for the crucial steps in the digital transformation journey: on-boarding, digitization, training, business solutions, and consultation. Sanje Private Limited came into being in January 2000 as the brainchild of an industry expert in Microsoft Solutions and enterprise content management (ECM). From its humble beginnings of operating in the premises of a garage with just two employees, the company today has grown in terms of facilities, number of employees, turnover and to the number of services it provides to the industry as a whole. Sanje Private Limited is a fully owned subsidiary of Tech One Global.